What if you could work with some of the best real estate brokers in New York for only a 1% listing fee? What if the only difference vs a traditional listing was the commission structure? We get it. New Yorkers want the real thing, but we want it for less. That’s why all of our partners are highly experienced traditional brokers who are willing to discreetly reduce their fee. Note: The 1% listing fee does not include the commission you choose to offer to buyers’ agents. We recommend offering a market rate buyer’s agent fee for full exposure. Sell your home for only 1% seller’s broker commission! Best of all, buyers’ agents only see the commission offered to them so no one will know you’re getting a better deal! We’ve negotiated private label discounts for full service with New York’s finest listing agents. Work with the best for less! We Get It. New Yorkers Are Busy. It’s pretty likely you won’t be able to leave work on a whim to show your apartment. What will you do when that all cash international buyer wants to see your apartment at 2 PM on a Tuesday? Who will arrange for photos to be taken and a floorplan to be drawn? Who will guide the buyer through the co op board package and review it before submission? Unless you work from home, you’ll need the assistance of a real estate listing agent to manage your sale. A home sale is a major life decision. Work with a real broker. We’ve partnered up with the most experienced, brand name brokerages in New York so you can work with the best. Will someone handle the entire sale process for me? Yes! Our service is identical in every way to you signing up for a full service listing with your local agent for 6% commission. The only difference is the commission structure. Don’t worry, just because you don’t have the time to sell For Sale By Owner doesn’t mean you need to pay 6% of your sale price in commission. You can save thousands on your closing costs without risking your home sale by working with one of our highly experienced, brand name partner brokers who never openly discount their services. As a result, you’ll truly get the real thing but at a better price! Why aren't discount brokers more common in real estate? Savvy sellers know there’s no such thing as a free lunch. There’s a reason why traditional agents dominate the market and the typical real estate commission in NYC is still 6%. That’s because buyers’ brokers are loathe to show properties listed For Sale By Owner and by discount brokers out to “disrupt” the industry. Why would they help a discount broker when there are plenty of other listings to choose from? So how does one safely and discreetly save on commission without risking their home sale? By working with one of Hauseit’s brand name, traditional partner brokers who never openly discount or otherwise tarnish their reputations. As a result, our partner brokers have great working relationships with the wider brokerage community. What is the difference between Hauseit’s Agent Managed Listing and a listing that costs 6% in commission? The only difference is how much of your home equity you will save. Your typical listing agent charges you 6% commission regardless of the outcome (even if you end up selling your home to a friend or neighbor). They will try to convince you that paying 6% commission is some sort of law (you should ask them if they’re a lawyer, as it’s not). Failing that, they will say that their fee is really only 3% as they must split the commission equally with a buyer’s agent in the vast majority of cases since 90% of all buyers are represented. Our full service partner brokers have agreed to charge only 1% while co-broking typically 2.5% or 3% to buyers’ agents. If our affiliates find a direct buyer, your total commission is subject to even further reduction! 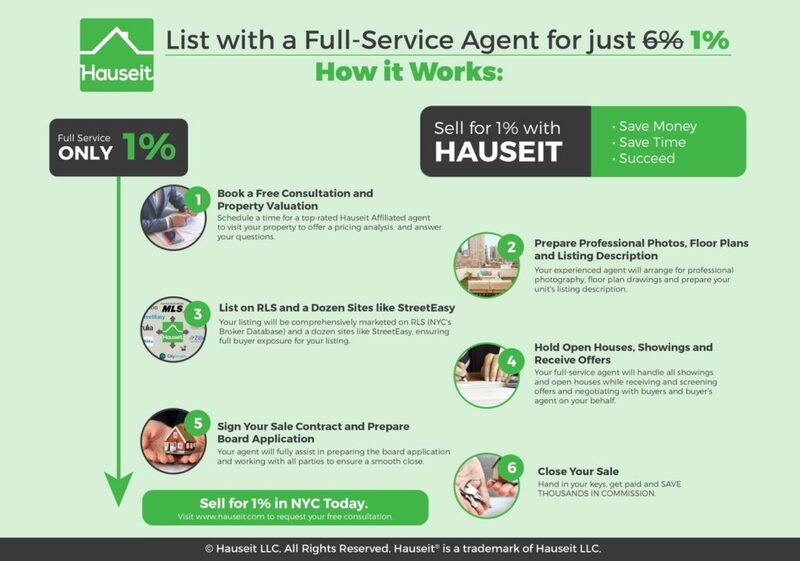 How much can I save with Hauseit’s Agent Managed Listing service? Because most buyers are represented by agents in NYC, listing agents usually make only half of the typical 6% commission. In the case that a buyer is represented, our affiliate brokers have agreed to take only 1% versus 3% commission in a normal broker to broker transaction. That means you would save on two thirds of the typical seller’s broker fee! With home prices at or above record highs, the savings you may achieve by working with Hauseit can be substantial. In New York City where the average home sale price now exceeds $2 million, every 1% in commission savings equates to another $20,000 in your pocket. How much do I save if the sale is with a direct buyer? With traditional full-service listing agents and their Exclusive Right to Sell listing agreements, you’d be required to pay the full 6% commission to the listing agent even if the buyer for your property is not represented by a buyer’s agent! Even if you do end up selling your home to a buyer represented by an agent, you can still expect to save 2.5% or more in agent commissions through Hauseit. The total commission you’d pay would be just 3.5% or 4% as opposed to the 6% charged by a traditional listing agent. The 3.5% or 4% commission you’d pay is broken down into just 1% to our partner listing broker and 2.5% or 3% to the agent representing the buyer (the exact commission amount may vary). You would therefore save at a minimum 2% in commission even if you co-broked a full 3% to buyers’ agents. 1Please speak with us for more details. The fee payable for a direct buyer is subject to negotiation with our partner brokers. Why should I use Hauseit’s Agent Managed Listing service vs selling my home For Sale By Owner? In addition to benefiting from substantial savings on broker fees, sellers who use Hauseit’s Agent Managed Listing service also benefit from significant time-savings and peace of mind knowing that you have a full-time advocate for your listing to pre-screen buyers, accommodate showings, promote your listing to the real estate community and keep track of all interest in your property. Our service is perfect for the busy home seller who wants to benefit from the significant financial savings of selling For Sale By Owner in NYC but who does not necessarily have the time required to screen buyers and constantly show the apartment to interested parties. How do I sign up for Hauseit’s Agent Managed Listing service? To get started, simply contact us and provide your property address, contact information and the best time to for you to speak. We will then reach out to schedule your complimentary, zero obligation home sale consultation. Our partner brokers will discuss your goals and questions on the sale process and prepare a marketing strategy for your home. You will also have the opportunity to discuss and agree on a reasonable initial listing price that works for both parties. All of our partners are established traditional real estate brokers who never openly discount their services. As a result, they maintain great working relationships with the wider brokerage community so you’ll never have to worry about other agents treating them or you any differently. Discreetly work with the best for less!